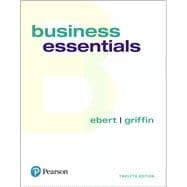 by Ebert, Ronald J.; Griffin, Ricky W.
Ronald J. Ebert is Emeritus Professor at the University of Missouri—Columbia, where he lectures in the Management Department and serves as advisor to students and student organizations. Professor Ebert draws on more than thirty years of teaching experience at such schools as Sinclair College, University of Washington, University of Missouri, Lucian Blaga University of Sibiu (Romania), and Consortium International University (Italy). His consulting alliances have included such firms as Mobay Corporation, Kraft Foods, Oscar Mayer, Atlas Powder, and John Deere. He has designed and conducted management development programs for such diverse clients as the American Public Power Association, the US Savings and Loan League, and the Central Missouri Manufacturing Training Consortium. His experience as a practitioner has fostered an advocacy for integrating concepts with best business practices in business education. The five business books he has coauthored have been translated into Spanish, Chinese (Simplified), Chinese (Traditional), Malaysian, Bahasa Indonesian, and Romanian languages. Professor Ebert has served as the Editor of the Journal of Operations Management. He is a Past President and Fellow of the Decision Sciences Institute. He has served as consultant and external evaluator for Quantitative Reasoning for Business Studies, an introduction-to-business project sponsored by the National Science Foundation. Ricky Griffin joined the faculty at Texas A&M University in 1981. During his career at Texas A&M, he has taught undergraduate and graduate courses in management, organizational behavior, human resource management, and international business. Professor Griffin’s research interests include workplace aggression and violence, organizational security, workplace culture, and leadership. His work has been published in such journals as Academy of Management Review, Academy of Management Journal, Administrative Science Quarterly, and Journal of Management. He served as Associate Editor and then as Editor of Journal of Management. In addition, Professor Griffin has also authored or coauthored several leading textbooks and co-edited three scholarly books. His books have been used at more than 500 colleges and universities on five continents and have been translated into Spanish, Russian, Polish, and Chinese. He has served the Academy of Management as Chair of the Organizational Behavior Division and as Program Chair of the Research Methods Division. He also has served as President of the Southwest Division of the Academy of Management and on the Board of Directors of the Southern Management Association. Professor Griffin is a Fellow of both the Academy of Management and the Southern Management Association. He has also won several awards for research and has been supported by more than $400,000 in federal research funding. Professor Griffin has served as Director of the Center for Human Resource Management and Head of the Department of Management at Texas A&M University. He has also served as Executive Associate Dean and Interim Dean at the Mays Business School.